I'll never forget the day they arrested my father-June 4, 1937. I was 14 years old at the time; he was 52. I had been at home, sleeping when they came after him. When I woke the next morning, I couldn't find my father. They had come in the night and searched all the rooms except the one in which I was sleeping. They had even searched the kitchen. We still have a copy of the order for his arrest and the list of the things they confiscated-his passport, birth certificate, five notebooks, personal correspondence, 23 photos, 115 books in Arabic, Persian and Turkish, and a basket full of manuscripts. The document has three signatories: Parshin, Pavlov from the KGB, and Verdiyev, our neighbor. 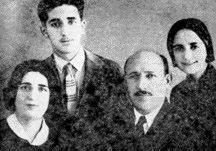 Left: Hossein Javid with his family in 1936, one year before his arrest. Turan, his daughter was 13 in this photo. Courtesy: Turan Javid. Some people say my father suspected that he would be arrested, but I don't believe that. Had he feared such, he would have removed his manuscripts from our home. On the night of his arrest, he tried to save his writings, but they wouldn't allow him to do so. The confiscation of those manuscripts was a great loss. They had never been published. We'll never know their contents. My mother, Mushkinaz Khanum, wrote about that tragic evening in her memoirs. "That night Javid smoked a pack and a half of cigarettes. Once while he was lighting a cigarette, one of the KGB officers took a cigarette from Javid's pocket. My husband offered him a light but was refused. Then Javid looked at me sadly and sighed." Left: Statue commemorating Husein Javid who was exiled in 1937 to Siberia where he died. Sculpture by Eldarov was dedicated in 1993. My father had never been a member of any party. He had never been involved in any political organization. The KGB accused him of being a founding member of a counter-revolutionary organization which was preparing a coup. That was not true but it was impossible to prove otherwise. He never admitted to those accusations. They always pressured the people they arrested to admit to the false charges. Some of them gave in when they were tortured but my father never admitted to being involved in any counter-revolutionary organization. There was no legal criteria for what they were doing in those days. They arrested Mikail Mushfig when he was 29, though he had written poems praising socialistic reality. Father was sentenced to eight years of imprisonment. They held him in Baku two years and then sent him to exile in Siberia where he died in 1944, seven years later. After his arrest, all our household goods were confiscated and my mother, brother and I were forced out of our three-room apartment and made to live in a single room of only nine square meters. As time passed and I grew older, I always had difficulties finding a job because of who my father was. I tried so hard. At last with the help of friends, I succeeded. Of course, my father's work was often criticized. He was used to it. In general, he never paid much attention. He would say, "That's their job. Let them earn their living." Despite the criticism, he was one of the most esteemed writers in the 20s and 30s. He often was criticized because he didn't write about the Soviet reality. They demanded that he focus on issues related to the Soviet power but he didn't. Soon after the Soviets came to power in 1920, he wrote a play called, "The Prophet," about Mohammad. A 1936 literature textbook for the 7th grade reads: "During proletarian years, Javid was doing his best to idealize religion which is the heritage of the bourgeoisie and landowners of Azerbaijan." In one of his plays, "Sheikh Sanan," which is about the love between an Azerbaijani young man and a Georgian woman, the heroes killed themselves for love. One of the government officials asked my father to change the ending so that the couple would end up being happily married. My father became very angry and tried to describe the norms of tragedy from Shakespeare's "Romeo and Juliet" and Fizuli's "Leyli and Majnun," but they still didn't understand. Despite these pressures, my father never criticized the system or spoke out against it at the meetings. People often wonder why my father's works use language so close to Turkish. Simply, he had been educated in Istanbul. He read many European plays in Turkish. I'm sure had he been educated in another country, he would have written under the influence of the language of that country. But within our family, we always spoke Azeri, not Turkish. Even today his plays are not easy for everyone to understand. But that was the style he chose. Once a young poet asked my father why his language was so difficult. He replied, "You write your way; I've already chosen mine." Javid taught Azerbaijani literature at the Theater College of Baku and some of this students became the most well-known in Azerbaijan's theater, such as Mehdi Mammadov, Ali Zeynalov. Mammadov later became a very famous theater director and producer who went on to write a book about him. I remember my father as a kind person and very protective of his family. He preferred the quietness of night for writing and always liked to start with a cup of coffee. Often, he worked until 4 or 5 in the morning. The next day, he would polish his material. Mother says he often recopied his writings several times, so they would look as neat as if they had been published in print. Though he worked late, he never let mother get up early. It was father, not mother, who prepared our breakfast when we children headed off to school. He always tried to get us to pay attention to our food and health and not to fuss much about clothes, as they were external. If we weren't healthy, he used to tell us, it wouldn't matter how well we dressed. Often times, he took us to the theater. I was 12 or 13 at the time. When we returned, he would ask me and my brother what we understood. My brother was older and very talented, but I was still very young and didn't understand very much. Afterwards, he would interpret the play, its actors and the directing to us as if we were much older. Maybe that's why I chose to become a theater critic myself. Father's books were published between 1913 and 1934. "The Past Days" ("Kechmish Gunlar") came out in 1913. "Spring Dews" ("Bahar Qayghilari") was published in 1917. "Maral," "Precipice" ("Ujurum") and "Topal Teymur" were printed in 1926. This four-volume collection was last published in 1982 but has a lot of shortcomings. The editor made changes in the text and altered some of the vocabulary. My father was "rehabilitated" (as they used to call it) in 1956 during Khruschev's period. But he wasn't duly appreciated until 1981. Probably, there was still fear of repression. People holding high positions had personally witnessed that period. After 1956, they slowly began publishing his works and they staged his play, "Sheikh Sanan." In 1963, they celebrated his 80th Jubilee in Azerbaijan though it was a rather superficial event. His true value as a writer was revived by President Aliyev who arranged to have Javid's corpse brought back to Baku from Siberia. After this resolution was adopted in 1981 on his 100th anniversary, my father's books were published (even in Russian), his plays were staged, and monuments were built in Baku and his home in Nakhchevan. Omar Eldarov, was commissioned to do a statue in commemoration of my father, which was unveiled in 1993 in front of the Academy of Sciences. Home museums were organized in these cities as well. President Aliyev even recognized the magnitude of Javid's work and in one of his speeches noted, "Javid is usually compared to Shakespeare, but I would compare him more to Goethe. Javid's "Demon" or "Devil" in "Iblis" is not weaker than the devil in Goethe's "Faust." "Iblis" is a strong philosophical play, which explores the possibility that the devil exists within human being. Such a devil is the worst enemy of humanity. In the play, it's the devil who brought on WW I. However, in general, Javid's devil should be interpreted more broadly as a symbol of all treason, murders, and wars. Ramiz Almuradli, a film director, has plans to make a film based on this play. After his exile, my father's name was never mentioned in school textbooks before the late 70s. That's when they started referring to him as a great writer and one of the victims of Stalin's repression. By the late 80s they were including a small section of his works in textbooks. Today, his literary activity and his artistic outlook is thoroughly studied. In fact, there is a new category in many textbooks called "Repression and Literature." It's amazing how times change. Turan Javid is the daughter of Husein Javid, who was exiled during Stalin's Repression in 1937. He is considered one of Azerbaijan's great epic poets. Jala Garibova contributed to this article.